People use various methods to make their Instagram profile look stylish and unique. Some people use creative photography to add a style to their Instagram profile, whereas, some use other design methods to make their profile stand out from the rest. If you are one of those Instagram who likes to style their Instagram profile then, this article covers a perfect app for you. Cornergram is a free Android app to make unique Instagram grid layouts. With the help of this app, you can add a design pattern to your photos before uploading them to Instagram. 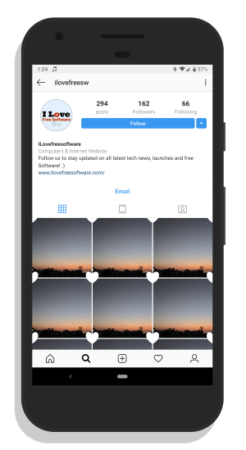 It offers design to add a circle, square, heart, and several other shapes to the photos which shows the respective shape between the pictures in Instagram profile grid. 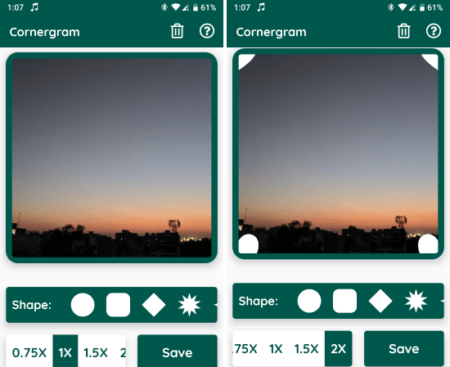 Cornergram app has a minimalist design with a straightforward process to add shapes to the photos. When you open this app for the first time, it asks for the storage permission to lists the pictures from your device. The main screen of this app has a button to open a photo. When you open a photo, this app analyzes its size and shows you an attention message in case the photo does not already have a 1:1 ratio (square). From this screen, you can crop the photo to make it square fit. The crop screen in this app has two options; crop and rotate. You can select the desired options by tapping on the respective icon from the bottom section. 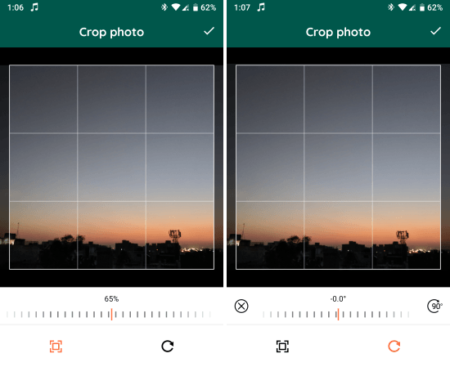 The crop option lets you crop the photos in a 1:1 ratio. You can exclude the extra photo-area or include black surrounding to make the photo square fit. Whereas, with the rotate option, you can rotate the photo at any desired angle. Once you have the photo ready, you can move to the layout section by tapping the check mark from the top right corner. You can add any shape layout to the photo simply by tapping on the respective shape. This adds a layout for that shape at the corners of the photo. In this app, you get four shape size options. You can choose any size for the shape as per your liking. After that, adding the shape and selecting the size, you can save the photo with the shape design to your phone by clicking the Save button. In order to make this work, you have to apply the same shape to all or several photos, obviously. And, when you upload those photos to the Instagram, they make the profile grid stylish by making the appearance of the selected shape in between the photos. You can see a preview of the grid design in the attachment above. Here, I used the heart shape and this is how it looks on the Instagram profile gird. Grab Cornergram from the Play Store. 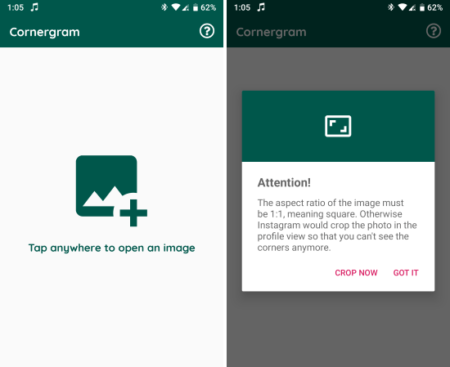 Cornergram lets you creatively use the otherwise useless space between the photos. This way, you can make your Instagram profile look stylish and unique.